Today is National Trisomy Awareness Day. Below are 10 important facts on Trisomy 18. 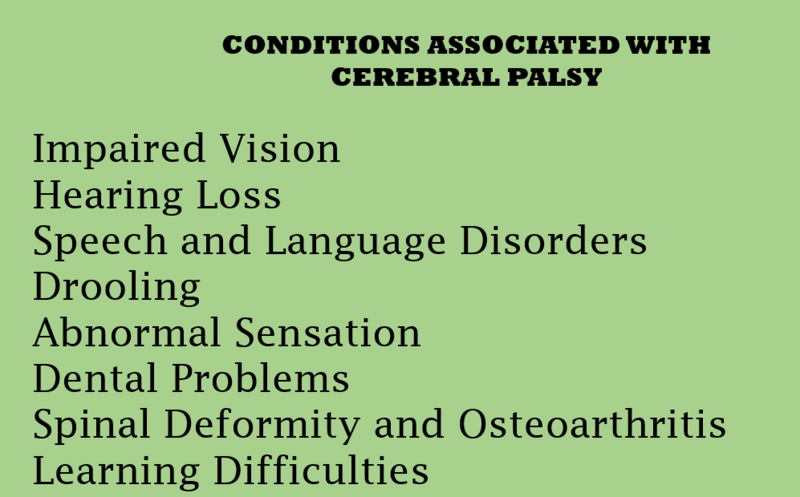 Cerebral palsy is a condition caused by damage to the specific areas of the brain. Cerebral palsy refers to the brain and palsy to muscle weakness. Cerebral palsy is a syndrome of motor impairment with posture and movement disorder. It is a non-progressive disorder, however, as a person begins to age, muscle and skeletal problems begin to worsen resulting in more pain, discomfort and limited mobility. Due to muscle flexibility, strength and endurance issues, there is a greater risk of falls and injuries. The following articles includes information on understanding how aging and adulthood affect people with cerebral palsy. March is Developmental Disabilities Awareness month! Although I blogged the definition of developmental disabilities here, I wanted to give you more information besides the Federal regulation. Quite often, people are confused between the definition of an intellectual disability and a developmental disability. A developmental disability is described as an assortment of chronic conditions that are due to mental or physical impairments or both. For example, you may have a child or an adult with an intellectual disability or perhaps a person diagnosed with cerebral palsy and an intellectual disability. It is also considered a severe and chronic disability that can occur up to the age of 22, hence the word developmental. A developmental disability can occur before birth such as genetic disorders (i.e. cri du chat, fragile x syndrome,) or chromosomes ( i.e. Down syndrome, Edwards syndrome); during birth (lack of oxygen) or after birth up to the age of 22 (i.e. head injuries, child abuse or accidents). The following are links to articles on various types of developmental disabilities including resources with facts and statistics, organizations, and sign and symptoms. According to the Epilepsy Foundation, epilepsy is the fourth most common neurological disorder and affects people of all ages. In fact, 1 in 26 people have seizures and while people who are diagnosed with epilepsy may have no other problems, this is not the case for children and adults with an intellectual and developmental disability where the rates are much higher. It is estimated that 30% of children with epilepsy also have another type of disability. Some studies show that children with an intellectual disability and cerebral palsy, had a 35% chance of developing epilepsy, children with an intellectual disability alone had an 8% chance and children with a brain injury occurring after birth stood a 75% chance of developing epilepsy. Statistically, the risky of a child with a developmental disability experiencing an unprovoked seizure by age 5 is 4 times likely than the general population. 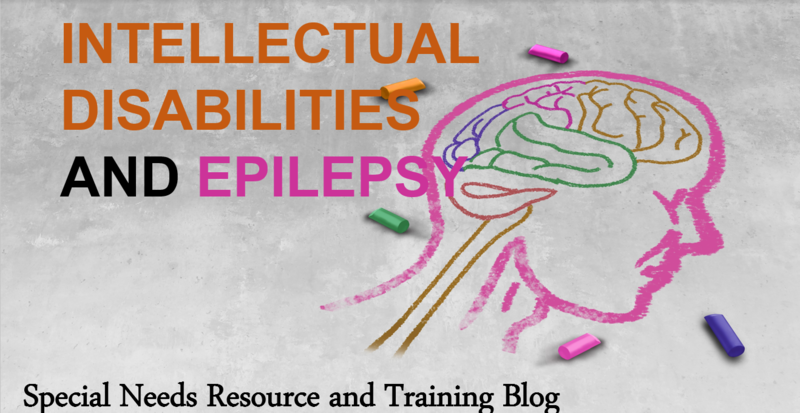 It is estimated 1.8% of U.S. adults have epilepsy compared to 22% among people with intellectual disabilities. People with intellectual disabilities tend to also have worse prognosis with adults having a higher rate of death including Sudden Unexplained Death In Epilepsy (SUDEP). At least two provoked (or reflex) seizures occurring greater than 24 hours apart. One Unprovoked (or reflex) seizure and a probability of further seizures similar to the general recurrence risk (at least 60%) after two unprovoked seizures, occurring over the next 10 years. A seizure is defined as an event and epilepsy is the disease involving recurrent unprovoked seizures. According to DSM-5, an intellectual disability is a disorder with onset during the developmental period that includes both intellectual and adaptive functioning deficits in conceptual social, and practical domains including deficits in intellectual functions such as reasoning, problem-solving, planning, abstract thinking, judgment, academic learning and learning from experiences. The severity levels range from mild to profound. Why is it important to discuss? Given the large number of people with an intellectual disability and epilepsy, treatment may be more complicated due to multiple impairments including people with a diagnosis of autism, intellectual disability and epilepsy. More research needs to occur which will help to reduce morbidity rates and help to develop accurate guidelines. Cerebral Palsy is defined as a group of disorders of movement and posture causing limitations due to abnormal development in the brain. 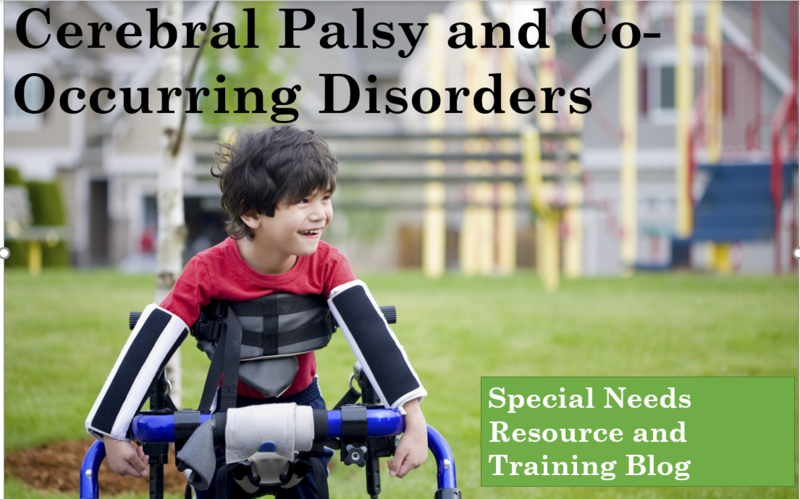 According to the Centers for Disease Control and Prevention (CDC), many children and adults with cerebral palsy also had at least one co-occurring condition and in some cases more than one. for example, it is not unusual for and individual to have a diagnoses of cerebral palsy with a co-occurring condition of epilepsy and an intellectual disability and associative issues with an eating disorder. Understanding both co-occurring conditions and associative disorders is essential in order to develop an effective teaching strategy. associative issues include aspiration, dysphagia, digestive issues, seizures, intellectual disability, sleep disorder, and speech impairments. The following links and articles includes information that contain research studies, articles and practical information. A newly published study has pried the lid off the mysterious phenomenon of “hyperfocus,” tying it inextricably to symptoms of attention deficit disorder (ADHD or ADD) in adults. Though not included in the official DSM-5 diagnostic criteria for ADHD, hyperfocus is a condition familiar to many individuals with ADHD who report becoming intensely focused on activities they find rewarding or interesting. You are probably familiar with IEP’s if your child or family member attend a public school here in the United States. For some people with a developmental disability, the next step may be attending a day habilitation program where adults with developmental disabilities receive Medicaid Waiver Services and has what is called an Individualized Service Plan (ISP). If you are new the ISP process, the following terms that you will hear often before, during and after meetings. Assessments. Serves to develop a body of information about an individual’s desires and goals his/her capabilities in areas in need of learning and skill development and the experiences or supports that will promote achievement of those goals. Background/History. Provides an overview of the life experiences of the person and family. Goals/Service. includes person-centered supports to enhance opportunities for individuals to make choices that increase their quality of life. An example would be a goal of increasing money or budgeting skills. Interest and Activities. Describes personal preferences, gifts and interests, as well as conditions to avoid. ISP Plan. A living document that provides details about what is important to an individual with developmental disabilities. It reflects a person-centered planning process. Natural Supports. Personal associations and relationships developed in the community that enhance the quality and security of the life for people including family and friends. Provider Program. The name of the voluntary agency delivering direct care to individuals with developmental disabilities. Providers may offer a variety of services and supports. Individual Service Environment. Provides self-directed, individualized assistance and support to individuals living on their own, either alone or with roommates in their own home or apartment. ISP Revision. Revisions and changes to the ISP can occur when an individual experiences a change in need throughout the year and must be reflected in the ISP. It is not necessary to wait annually to make the revisions. The date of the revisions should be reflected in the ISP. HCBS Waiver Services. A Home and Community-Based Service (HCBS) Waiver is a Medicaid program designed to meet the needs of children and adults who prefer to get long-term care services in their home or community, rather than in an institutional setting. Medicaid. is a jointly funded, Federal-State health insurance program for low-income and people in need including children and adults with disabilities. It is a government insurance for people whose income and resources are insufficient to pay for healthcare. A Medicaid number is needed for an ISP and is used to bill services. Person-Centered Planning (PCP). An ongoing problem-solving process used to help people with disabilities plan for their future. It allows individuals to be engaged in the decision making process about their options, preferences and values. Protective Oversight. is a documented and approved plan used for the sole purpose of enhancing individual safety. It list the key activities that affect health and wellness of an individual. Safeguards. a measure taken to protect the individual from harm by providing information on how it will be addressed. An example is fire evacuation. If a person is not able to evacuate independently from a fire emergency, protections are put in place to ensure his or her safety. Service Provider. The name of the voluntary agency delivering direct care to individuals with developmental disabilities. The provider may offer a variety of services and supports. Value Outcome. Statements that represent what is important to the person. It may include what the individual needs, wants to change or would like to maintain in his/her life. Outcomes are developed through the ISP process. This is an introduction to identifying street signs for children and young adults learning how to cross the street safely. The worksheet includes signs needed in teaching street crossing safety. Once you have printed the worksheet, cut the individual traffic signs and laminate. 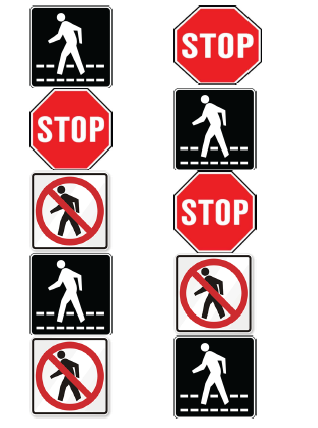 Explain each traffic sign and have the individual repeat. Once the signs are separated, mix them up and have the individual point to the correct ones.